Hello, stranger. How've you been? For the past few year over on The Rocketry Forum, there has been a thread each year where people can log the Newton-seconds they've burned flying rockets that year, called the Newton Tally Thread (here's this year's). I can never participate in this thread, because I always quickly lose track. I'm not one of those rocketeers who diligently record the details of every flight, though I should be. This year, however, it's been easy. I have flown exactly 0.0 Ns to date in 2018. What with the birth of Little N00b and our current lack of a car, I haven't been able to attend any launches at all. And I'm really itching to get out there and fly. Mrs. N00b and I have plans to get a decent vehicle, and we've got plans to go to at least one launch this year, even if we have to rent a car. The last annual FlisKits launch, run by CMASS, celebrating Jim Flis' 16 years in business, will be on September 15 in Amesbury, MA. It's going to be a big one. The FlisKits launch was my first club flying experience three years ago. There's cake and food, and hundreds of flights in one day. If I only get to attend launch one this year, this has to be it. 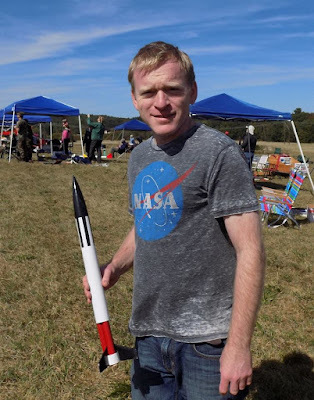 So, I haven't flown anything, and if you follow this blog, you know that I haven't written much in the past few months, but that doesn't mean rocketry has completely been on the back burner for me. In addition to doing The Rocketry Show podcast, I've been building. It's gone much more slowly for me recently, since I don't get as much time to myself. If Little N00b needs something, the rocket has to wait. But I've been chipping away at it, and have finished a number of builds I'd like to share. A lot of my progress has already been posted on Instagram (you can follow me @rocketn00b), and some on Twitter, and a little bit on my Facebook page. Since I don't always have the time lately to do little experiments or research a topic to write up something for this blog, I'm going to start a few build series. I've got a few rockets I'm pretty proud of - and some which I learned I should have done differently. I have a good backlog of photos, so there's plenty of potential material there. Look for the first one soon.